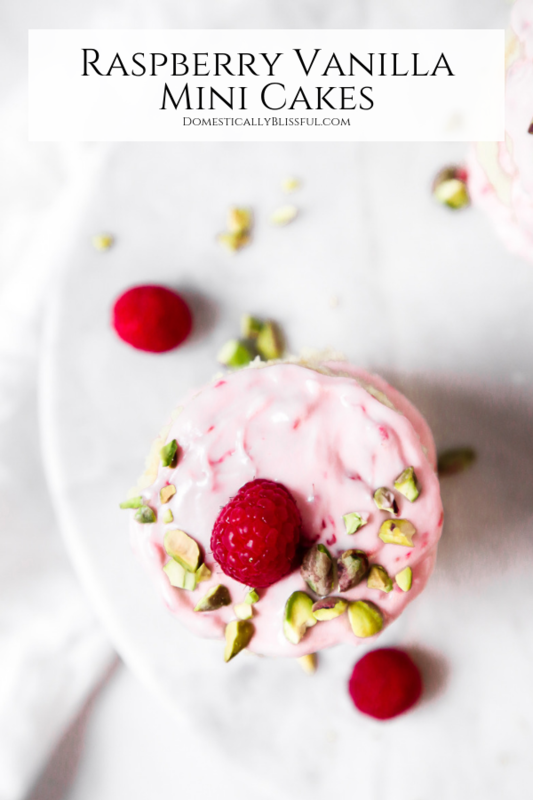 These Raspberry Vanilla Mini Cakes are layered with raspberry cream cheese frosting & topped with chopped pistachios. 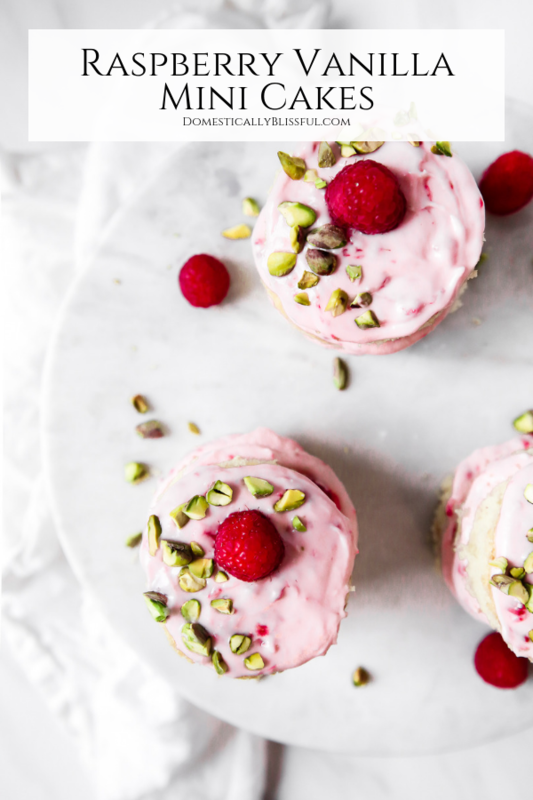 Aren’t these Raspberry Vanilla Mini Cakes absolutely adorable?? Ever since last year I’ve been obsessed with the idea of creating mini cakes with small round layers of french vanilla cake held together by homemade raspberry cream cheese frosting. Unfortunately, the reality of these little towers was more complicated than I first anticipated. Even though they are not that tall, gravity was not in my favor while stacking them. And I always want to be honest with you about the recipes I share. For full disclosure, there are several toothpicks stuck into each of these Raspberry Vanilla Mini Cakes to keep them from leaning or toppling over. My mom recently made mini cakes with only two layers & gravity didn’t work against them. So if you leave it at two layers you should have no leaning issues. If you really love the look of 3 layers (I do too) you may want to use a big biscuit cutter so that the base is almost as equally wide/deep as it is tall. Next time I make this I am definitely going to use the largest biscuit cutter I can find because I think that will solve the falling/leaning issue I had this time & then I won’t have to use any toothpicks. Because let’s face it, this recipe is too cute not to make! Especially if you love raspberries. And speaking of which, if you if you love baking with raspberries I highly recommend these Lemon Raspberry Cheesecake Bars & these Raspberry Cheesecake Brownies. But no matter what you decide to bake, I hope you have fun experimenting in your kitchen while making deliciously sweet creations! Line 1 rimmed baking sheet (12 x 17 inches) with parchment paper & set to the side. Prepare the cake mix according to the packaging instructions & spread the batter evenly over the parchment lined pan. Bake for 15-18 minutes until golden & a toothpick comes out clean. Remove the parchment paper/cake from the pan & let it cool completely on a wire rack. Once cooled, place the cake in your freezer to chill for 1-2 hours. This makes it easier to cut later. Use a round biscuit cutter & a small knife to cut each round cake layer. *(1) Set to the side. Next, blend the cream cheese, butter, & 2 teaspoons pure vanilla extract until smooth. Blend in 1 cup fresh raspberries until combined. Fill a frosting bag with your frosting & pipe the frosting onto the top of the first layer. Add a second layer of cake & frosting. 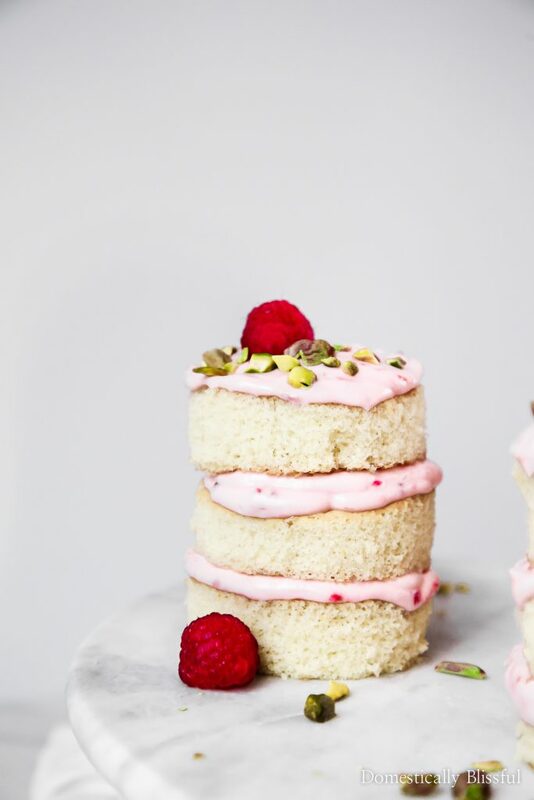 Top with the final layer of cake, frosting, 1 raspberry & chopped pistachios. Continue this process until you have made all of your Raspberry Vanilla Mini Cakes. Chill until ready to serve & enjoy! I wiped off the knife & biscuit cutter after cutting each layer. To ensure proper measuring use a spoon to fluff the powdered sugar & then spoon the powdered sugar into your measuring cup so as not to compact the powdered sugar when measuring. 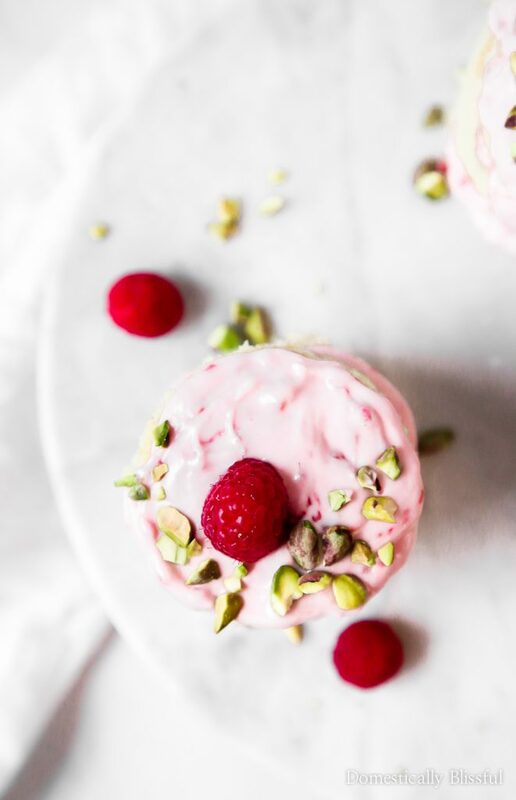 If you make these Raspberry Vanilla Mini Cakes be sure to share a picture & tag @DomesticallyBlissful on Instagram so that we can all see your beautiful dessert! 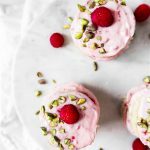 What is your favorite thing about this recipe, the raspberries or the pistachios? my shield & the horn of my salvation, my stronghold.